Today I wanted to report on the progress of The Grand Illusion. Normally I do that on Thursdays and I was planning on posting a game review today but I’m excited about the game so I figured I’d write about it. I’ve begun prototyping! I have created a deck of skill cards. These cards represent the 9 types of magic in the game. The types of magic are in two separate tiers: basic and advanced. There are 6 basic types and 3 advanced types. Here is a picture showing the skill cards (thanks to The Game Crafter for blank cards – They have blank poker cards on sale right now for 1 cent each!). Collect these and use them to perform never-before-seen magic tricks to appease your growing audience! Those are hand-drawn icons, people! The next step for the prototype is to create a deck of Trick cards. These are cards that represent magic tricks. During the game you’ll need to collect the skill cards shown above and then turn them in to complete the magic tricks. Once you perform a magic trick you will earn the rewards and audience shown on the card. So let’s discuss audience… Audience is actually a currency in the game. It is necessary to build an audience during the game or you will not meet the requirements on your Grand Illusion card. So each time you perform a trick, if successful, you will gain audience. In the game you will collect skill cards, spend them to perform tricks, gain audience and increase your skills to be able to perform better tricks. There will definitely be some engine building in the game. The goal of this design is to be an entry-level game with an easy rule set that is quick to teach and play. The main mechanics are set collection and engine building. Engine building in games refers to the idea of obtaining some ability or benefit that let’s you do things a little better, then getting another one that builds on the previous ability or benefit. In The Grand Illusion the engine is represented by the skills each magician will gain. Will you become a master of vanishing acts? Perhaps you’ll be the best at restoration magic? Ultimately you’ll have to get proficient at at least two basic types of magic and one advanced magic. In the game Splendor players turn in poker chips to grab a card from the table. Once they grab that card it usually acts as a poker chip. So for future card grabs they need one less poker chip. This would work perfectly for The Grand Illusion but I don’t want to copycat an existing game. A tech tree is something where you must complete “Level 1” stuff before you can work on “Level 2.” So in The Grand Illusion I could have a tech tree (pyramid) of trick cards on the table. When a player would perform a trick they would place a token of their player color on the trick to show they’ve completed it. This would also direct their play as there would be advantages and disadvantages for breadth versus depth. I think that once I create the Trick deck I’ll try out both of these options. The Splendor-like version may work better, but I’m more drawn to the Tech Tree version since it is more original. My goal is to prototype the skills deck this weekend and aim for the first playtest next week! Thanks for reading. I’d love to hear your thoughts about the different engine building options. As I continue to work on The Grand Illusion I get more and more excited about the potential of the game. Not only is it focused on Victorian era magicians and illusionists, but I also think that the gameplay in interesting and intriguing. As a street magician/illusionist it is your dream to work your way up and have a popular show in a highly successful theater. To do that you must win over the crowd, from the few stragglers on the street at the start of the game to larger and larger audiences as your reputation advances. You objective in the game is to increase your skills and earn enough reputation to successfully perform your Grand Illusion to as large an audience as possible. Points are awarded based on your skill levels, the size of your audience (this potentially may change), and the number and variety of tricks you performed throughout the game. Every great magic trick consists of three parts or acts. The first part is called “The Pledge“. The magician shows you something ordinary: a deck of cards, a bird or a man. He shows you this object. Perhaps he asks you to inspect it to see if it is indeed real, unaltered, normal. But of course… it probably isn’t. The second act is called “The Turn“. The magician takes the ordinary something and makes it do something extraordinary. Now you’re looking for the secret… but you won’t find it, because of course you’re not really looking. You don’t really want to know. You want to be fooled. But you wouldn’t clap yet. Because making something disappear isn’t enough; you have to bring it back. That’s why every magic trick has a third act, the hardest part, the part we call “The Prestige“. I love when games escalate and this simple three-step process of Pledge, Turn, and Prestige is ideal for that. However, I don’t want players to only work on one trick throughout the game. So I would rather have the game work in three stages where things ramp up automatically as if a player were progressing from the Pledge to the Turn and finally to the Prestige. The question is whether or not I can accomplish that through the game design. These represent the only types of magic a player can perform early in the game. It will be important to perform these because they will allow you to “unlock” new magic types by increasing your skills. Let’s explain these in more detail. You can turn in magic cards from your hand to complete an available face up trick on the table. These trick cards will have magic requirements. When you turn in the correct cards you will “perform the trick.” After that, take the trick card and place it face up in front of you. This card will have a magic type on it that represents a skill you can now increase. It also has an audience rating. The audience rating will be important for being able to perform your Grand Illusion. It will be important to keep your hand stocked with the correct types of magic cards as you work up to your Grand Illusion. You can simply draw magic cards from the face up cards or the deck based on your skill levels. Once you have successfully performed tricks those cards will be in front of you. To increase the skills shown on the cards you will have to turn in different sets of magic cards. When you do you can then place a skill marker on the trick card to show that you have increased that skill. If you have several cards of the same type you can simply stack them in a way that you can still see how many you have. Your skill level will tentatively be number of cards times number of skill increase tokens. Increasing your skills is necessary to be able to perform your Grand Illusion. The game ends once a player has performed their Grand Illusion. When they do, all other players will have one final turn. In the game you can focus on a singular path toward your Grand Illusion and try to maximize skill points on one type of magic. Alternatively you can attempt to score via breadth of magic types and complete a high variety of tricks. Ultimately this game will be a race to complete your Grand Illusion. But hopefully along the way there will be fun and interesting decisions. It’s time to prototype this. I’m ready to get this to the table and start playing it. I’m pretty happy with the direction it is going. After the feedback from readers regarding the drafting mechanic I think I’ll save that for a different game. I believe it was distracting from the thrust of what I want this game to be. So it’s gone and I’m ready to start playtesting (once I put some cards together). It will be my goal to create a PNP file to share once I’ve playtested a few times so that I can possibly get some early feedback from gamers and designers. I’ll keep you posted. Thanks for reading! Today I continue with my open design for a game based on Victorian era magicians and illusionists. Two weeks ago I talked about the core mechanics of the game. I also mentioned the “currency” in the game being the different types of magic. What this will ultimately boil down to is a set collection card game with a drafting mechanic and an inherent build up as players try to complete their secret Grand Illusion. Note: I have not yet decided if I want each player’s Grand Illusion to be secret or not. If it is public then the drafting mechanic becomes more important as you can see what types of magic your neighbors may be working towards. And if you can see their magic types then you may want to take a sub-optimal card because it would have been a great card for them. So let’s talk a bit about the drafting mechanic. You are dealt a bunch of cards. You choose one card and keep it. You pass the rest of the cards to your neighbor. You receive the cards from your other neighbor. You choose one of these new cards and keep it. You pass the rest of the new cards to your neighbor. Well, I’m not doing it quite like that. I want there to be a more random feel. The struggle with making an awesome drafting mechanic is in the consideration of how you want players to feel throughout the process. I want the players to feel like magicians while playing this game. So how could my drafting mechanic incorporate that feeling? I think there should be an element of sneakiness. Magicians utilize sleight of hand and I want an element similar to that. So I would want players to be able to have moments where choosing the right card was rewarding like a successful sleight of hand. The question is: How do I accomplish that? I put a bad card in someone else’s hand. I put a great card in a hand I knew I would receive. I was able to prevent another player from a great hand. I was able to craft a great hand for myself. Those are a few things that would allow me to have a rewarding feeling and a feeling of accomplishment. Often, as a game designer, it is a challenge to take a concept of what you want and actually turn it into mechanics that meet that concept. Pass to the left. Choose one card. Place face up on left neighbor’s pile. Pass to the left. Choose one card. Place face up on right neighbor’s pile. Pass to the left. Choose one card. Place face down on own pile. What this creates is a magic hand of five cards. Three were chosen by you (one face up). One was chosen by each neighbor (face up). The other players may be able to remember what your final card was, but your first card will be a secret since you chose it before anyone passed their cards. Now each player will have five cards in their hands. These cards will have the different currencies on them (the types of magic). In the middle of the table are the magic tricks that can be performed this round. Players will use combinations of the magic types in their hands to fulfill as many magic tricks as they can. This fulfillment will be the topic of the next article on The Grand Illusion. Hopefully this drafting mechanic will work to create an interesting dynamic between the cards one chooses to keep and the cards they choose to give to their neighbors. Any thoughts about this? Remember, I would love to be designing this game with your feedback. Anything sound good, bad, or meh? Let me know. That gives 6 “currencies” in the game that can be used for set collection. As I mentioned last week the idea is that you are a street performing magician looking to gain a reputation, earn some dough, and eventually find yourself on a stage performing a grand illusion for the masses. This will be mostly a card based game unless the direction of the game changes. For now I have created preliminary icons for the 5 main magic genres listed above (excluding the Grand Illusions). Players will begin the game with a hand of cards. They will also have their “Grand Illusion” card, which is private. There will also be a few magic tricks to perform that are laid out on the table. In each round the magicians will perform a random draft. Here’s how that will work. Each player will decide which card they want in the pool of available cards. So each player will take one of their cards and put it face down in the middle. Once all players have chosen a card, then one random card from the deck will be added. Then the player with the smallest reputation will pick up the pile, look at the cards, and play one face up in front of them. All other players will follow in order of smallest reputation. Once all players have placed one of the cards face up, each will have the opportunity to perform a magic trick. To perform a trick you must have a set of cards that appropriately matches one of the face up magic trick cards. So a trick might require 2 “Escape” skills and 1 “Levitate” skill. If you have played these cards in front of you then you can complete the trick. Turn in the three cards you used and take the completed magic trick card and place it in front of you. These completed magic trick cards will have an icon or icons on them that allow you to perform better magic. Some will have icons that are not available in the standard pool of cards that are dealt to players. So players must complete magic tricks to gain the skills they need to complete their Grand Illusion. Once a player completes their Grand Illusion, the end of the game is triggered. All players will have an equal number of turns to attempt to complete their Grand Illusion. If only one player completes their Grand Illusion, they are the winner. If several people complete their Grand Illusion, then a tie breaker goes to the player with the most completed magic tricks. So now that the framework is set for how to play, the next step is for me to mock up some cards and solidify the actual gameplay. Here’s where you all can join me in the design. I want you to provide names for magic tricks. I’ll use these as the names on the prototype cards. If they are really good names then I’ll use them as one of the Grand Illusions. Also, I would love your feedback on the basic gameplay here. As I was writing this article I realized that this game has a feel very similar to Splendor or The Builders. There is definitely some engine building with simple card mechanics. I’m not too worried about that since I think the drafting mechanic makes it different enough. But I really want your suggestions! I came up with a new game design theme a few weeks ago and it’s still rattling around in my brain. So I figure I should try to turn it into a real game design. For some reason I’ve decided to do all the design publicly on this blog. I think this will be a fun way to show people what is all involved with the game design process and I’m also looking for involvement from all of you! So these design articles, starting today and continuing on Thursdays, are meant to be an open source forum of sorts where I welcome your comments, ideas, suggestions, etc. 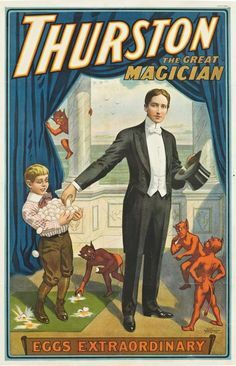 I love the look and feel of vintage magician posters from that era. I love the movie The Prestige. It’s a fascinating movie about competing illusionists in the early 1900s. If you’ve never seen it, I highly recommend it. For me magic has always been an intriguing thing. Last year I had the chance to visit the Harry Houdini museum in Appleton, Wisconsin. It was neat to learn about his story and more about the era as well. It seems like an interesting time to have lived. So I want to make a game about competing illusionists from that time. Therefore The Grand Illusion is all about magicians and their competition to earn the best reputation. You are a street magician in the early 1900s beginning your career. You’ve got a few tricks up your sleeve that no one else has mastered. It’s time to build a reputation and become a household name in the field of magicians. You start small doing a few tricks for small crowds on the street. Do them well and your skills will increase, as will your reputation. When you’ve got enough of a following then it’s time to take your show to a real stage. But beware, the crowd will always be expecting bigger and better! If you can find a way to continually master new tricks and perform them flawlessly, then you may end up as the greatest magician of all time! My original thoughts for the gameplay involve card drafting and set collection. The concept is that you have to collect sets of cards that allow you to perform certain tricks. The bigger the set, the more likely you are to perform the trick flawlessly. But there’s a catch. You know the old “Ball and Cup” trick? The idea of the trick is that there will be a ball under one of three cups. Then the magician will move them around and try to get you to lose track of which cup the ball is under. I want to utilize this as a mechanic in the game. If players each contribute a card to a common hand these would represent the cups. Then if there were a special card added to that hand it would represent the cup with the ball. Then players would blindly draft and whomever pulled the cup-ball card would get to perform the best trick. That’s my basic original concept for one of the mechanics in the game. What I want players to feel throughout the game is a sense of accomplishment while teetering on a sharp edge. Players should attempt tricks and illusions throughout the game but always with some risk of failing and letting down the fans. Each set of cards used for performing tricks will have several different symbols on them. These symbols represent different illusionary skills such as sleight of hand. When you complete a trick you can increase your skills in any or all of those categories. One emphasis for that decision making process would be that each player has a Grand Illusion that they are working toward completing. Like a private scoring condition, the Grand Illusion card that each player holds is a trick that could provide a huge boost near the end of the game. It is a trick that can only be attempted once, so players will want to make sure they have a skill set that will help them perform the trick with high success. The idea is that as players become better magicians and build an audience and a reputation they realize that they have to keep increasing the awesomeness of their tricks or else the audience might go to another magician. So by performing their Grand Illusion it could put them at the top. So that’s the current state of the design. It is just a bunch of basic concepts. But that’s where you all come in. What would you like to see in a game about Victorian era magicians? What mechanics, themes, components would you like to see? Let’s design this together. Please comment on this article or reply on Twitter. I’m looking forward to designing this publicly with all of you. Thanks for reading!